Here-we-go. Apocalypse all over again. Earlier in the day, I posted my thoughts on tumblr, and here about the bond-boys basically controlling the economic world at the moment. Its frustrating to watch the magnitude of this action. I was a bit annoyed because Italy's CDS rose to a new yearly high. The high was hit today, not last week or two weeks ago. Weeks ago, with Greece at the precipice of defaulting which would have caused the very real domino effect, Italy's CDS' were below its high. So with Greece austerity in place (just like all of the municipalities of The States are doing), and bailout funds given, the bond-boys and hedgies simply 'decided' to act on Italy? This begs the question, what happened in a week that sparked this move? I have a hard time honestly answering that question. (I have my speculation, but as stated in my tumblr post, I'll keep that to myself.) 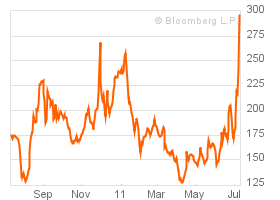 And with a VIX move of +15%, plenty of others felt that way too. Italy's problems are well known for some time now. Here is a link of an article highlighting many of the issues, originally published in late May. Any one reason highlighted in the article could be used to justify the current spike in yield. But why now? Again, here is where theories run rampant. But I have this crazy notion that this 'threat' will end as suddenly and as illogically as it began. The market has a series of supports via the daily SMAs (the 14, 28 and 32). It also has the weekly support near current levels. With the above said, I did start re-entering traded positions in POT and AAPL. Still waiting on GOOG and others.